15 Bibles and over 65 References--Some of the most skilled Mac programmers in the business, with over 40 years of combined experience, have brought their vision for QuickVerse Bible study software for Macintosh to life! The Macintosh Operating System, user base, and hardware platform are definitely not foreign territory to QuickVerse; and crossing platforms is not a new practice for our company. As Macintosh users ourselves, we at QuickVerse embrace this platform for its simple and intuitive Operating System and application base. - Publisher QuickVerse Mac has been created from the ground up to be a truly universal and native OS-X application. Extremely easy to use, the 3.0 edition provides distinctively Mac features to anyone interested in Bible reading and Bible study, sermon preparation, or teaching. Designed for both casual readers and serious Bible scholars, Mac users will discover QuickVerse Mac 3.0 to be the most intuitive, Mac-friendly Bible study software on the market today! QuickVerse Mac Black Box contains 17 Bibles and 104 Reference Works. About "Quickverse 2007 Macintosh Black Box Edition CDROM"
QuickVerse Mac has been created from the ground up to be a truly universal and native OS-X application. Extremely easy to use, the 3.0 edition provides distinctively Mac features to anyone interested in Bible reading and Bible study, sermon preparation, or teaching. Designed for both casual readers and serious Bible scholars, Mac users will discover QuickVerse Mac 3.0 to be the most intuitive, Mac-friendly Bible study software on the market today! 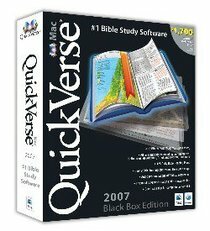 QuickVerse Mac Black Box contains 17 Bibles and 104 Reference Works.